The New Year’s arrived with a vengeance with gale force winds and torrential rain across the UK. There’s no better time to protect you and your doorway, as well as making the most of our January 20% off Scoop canopy sale. Our solid steel Scoop Canopy, as shown in the picture, is an effective design for most front or back doors. This door canopy is shown with our wall trellis panels, all matching in the aged zinc galvanized finish. 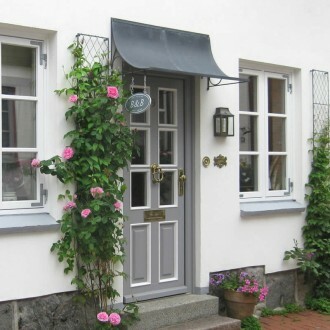 Our customers kindly took this image of their front door in Germany last year to show how well the door canopy and panels suited their property, and to say how delighted they were with our products. If you would like to get in touch to discuss any details with us, or to take advantage of the 20% discount off single Scoop canopies, please call us on 01225 851577.